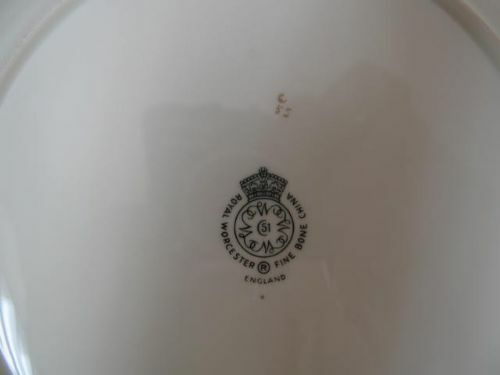 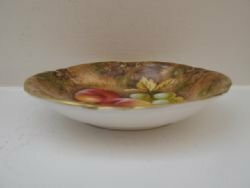 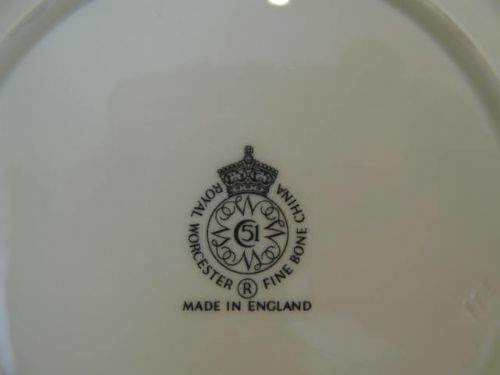 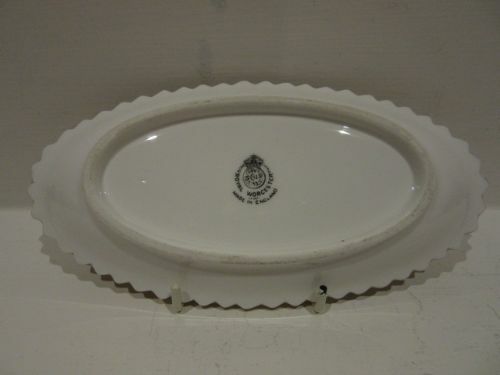 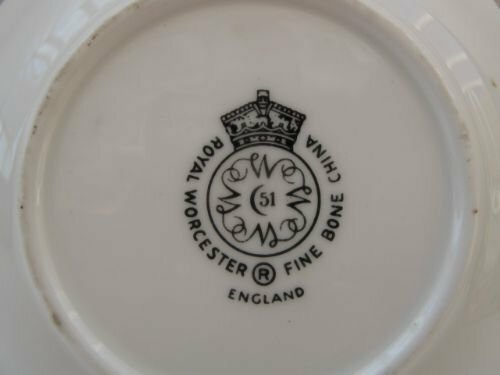 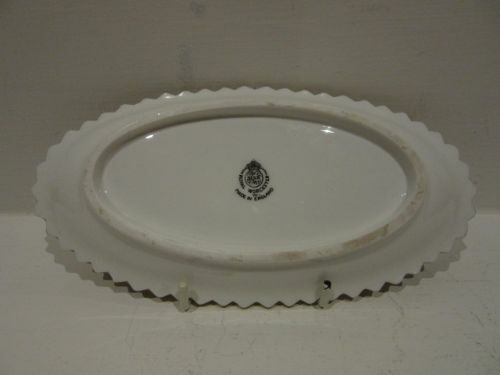 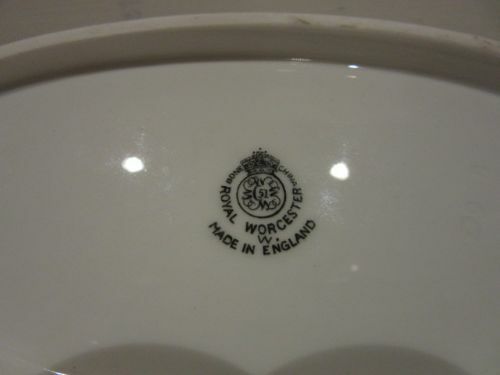 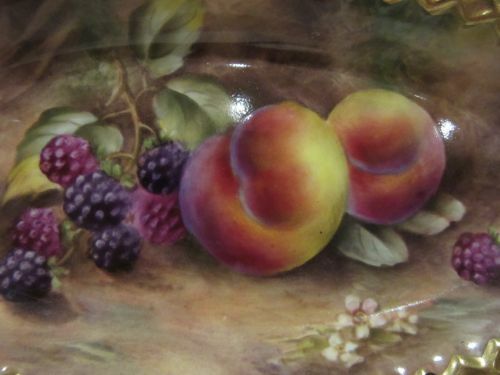 A Royal Worcester Fruit Painted Oval Dish By Freeman. 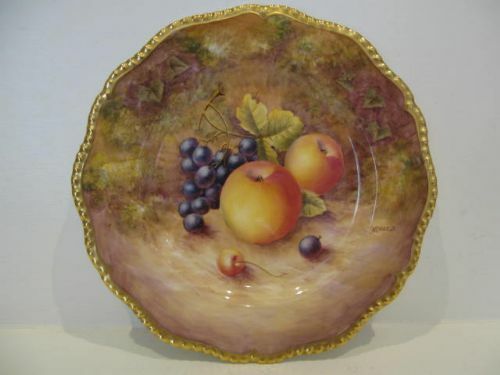 A good Royal Worcester porcelain oval dish, with attractive and heavily gilded "pie-crust" rim and decorated with well painted plums and brambles against a mossy background by John Freeman. Measuring approximately 7.1/4"long x 3.5/8"wide x 7/8"deep, it has the black factory stamp for 1953 and is in excellent condition with no damage, crazing or restoration and the gilding is bright and virtually without wear. 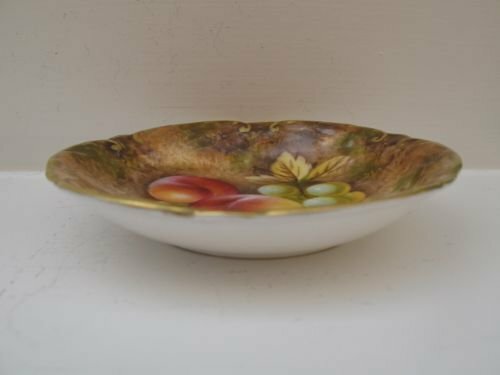 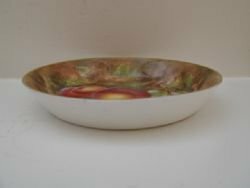 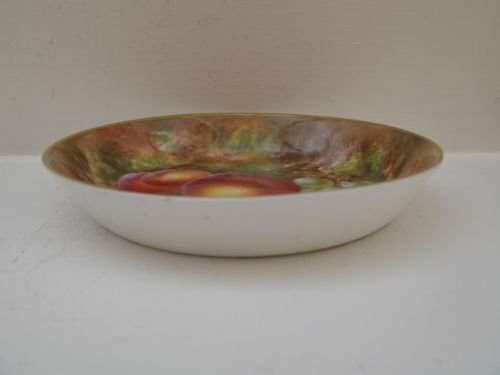 A Royal Worcester Fruit Painted Oval Dish By Peter Platt. 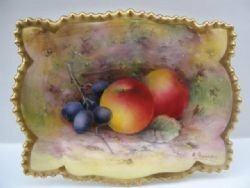 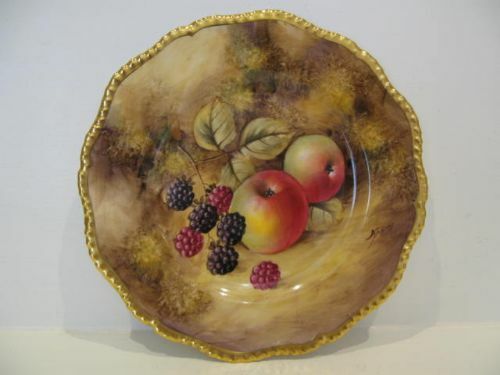 A good Royal Worcester porcelain oval dish with heavily gilded "pie-crust" rim, and decorated with well painted brambles and plums against a mossy background by Peter Platt. 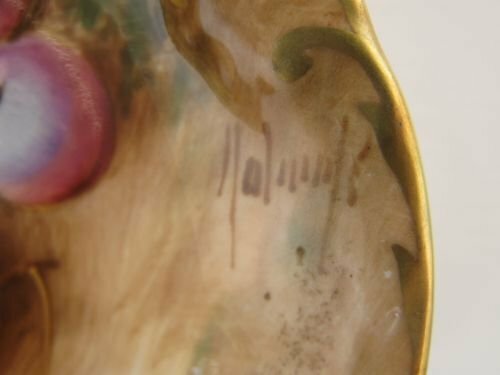 Measuring approximately 7.1/4"long x 3.1/2"wide, it has the black factory stamp for 1951 and is in excellent condition with no damage, crazing or restoration and the gilding is bright and virtually without wear. 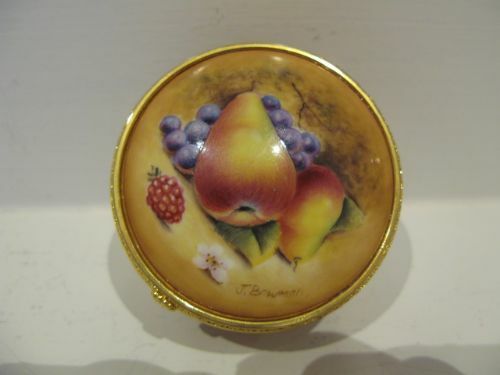 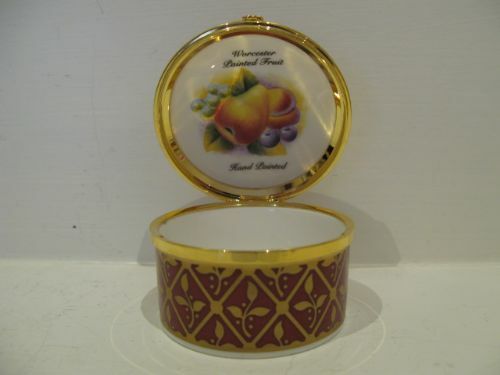 A Royal Worcester Fruit Painted Pill Box By J Bowman. 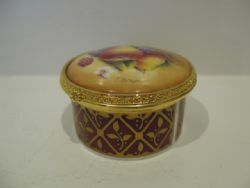 An attractive Royal Worcester porcelain and gilt metal mounted pill box, with fruit painted decoration by Jason Bowman. 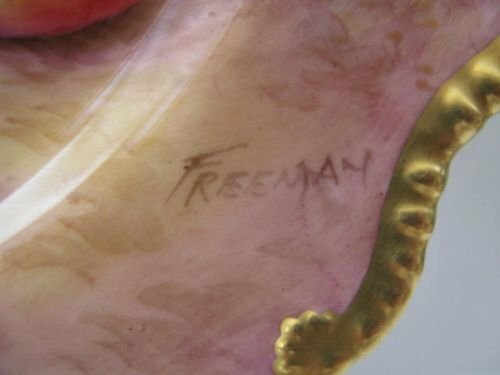 Standing approximately 2.1/2"diameter x 1.1/2"high, it is number 24 of a limited edition issue dating to around the end of the 20th century and is in excellent condition with no damage, crazing or restoration and the gilding is without wear. 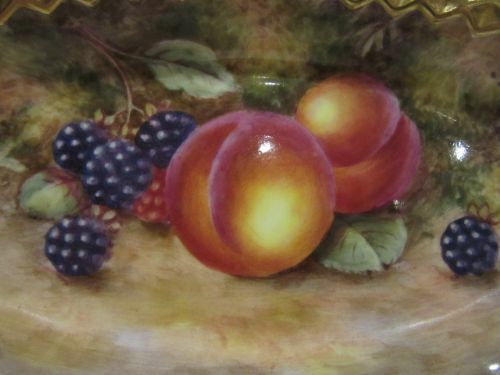 A Royal Worcester Fruit Painted Pin Dish By Edward Townsend. An attractive, Royal Worcester porcelain pin dish of rectangular shape, with heavily gilded gadrooned border and well painted fruit decoration by Edward Townsend. 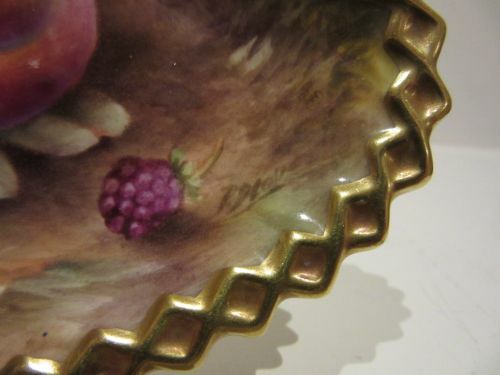 It measures approximately 5.3/8" long x 4.1/8" wide x 7/8" deep with the puce factory stamp for 1925, and is in very good condition with no damage, crazing or restoration, and the gilding with only the slightest signs of wear. 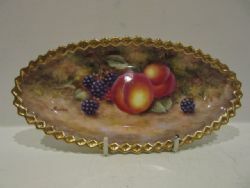 An attractive, Royal Worcester porcelain pin dish of rectangular shape, with heavily gilded gadrooned rim and well painted fruit decoration by Edward Townsend. 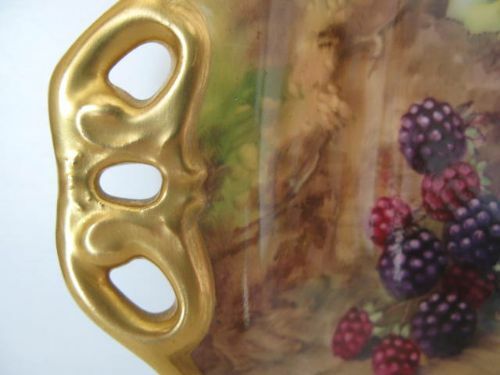 It measures approximately 5.3/8" long x 4.1/8" wide x 7/8" deep with the factory puce stamp for 1926 and is in excellent condition with no damage, crazing or restoration, and the gilding is unworn. 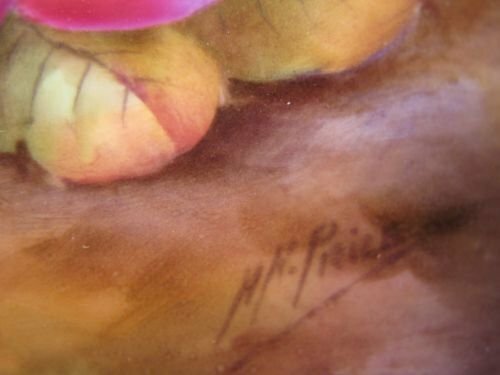 A Royal Worcester Fruit Painted Pin Dish By Horace Price. 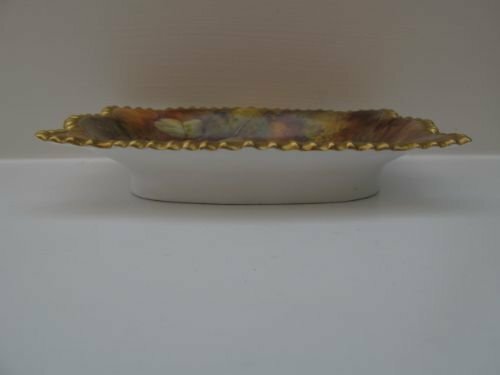 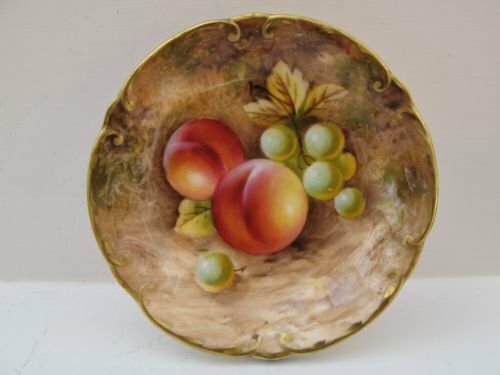 An attractively shaped, rectangular Royal Worcester porcelain pin dish, with heavily gilded rim and very well painted fruit decoration by Horace Price. 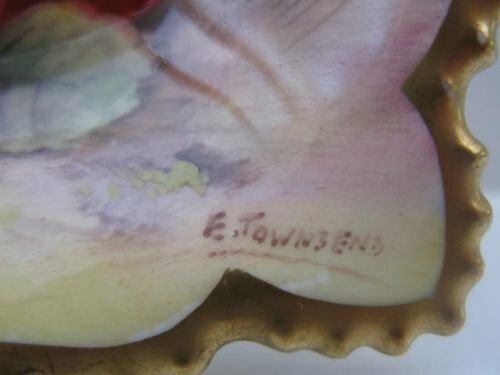 Standing approximately 5.1/4" long x 4" wide x 7/8" deep, and with the puce factory stamp for 1937, it is in excellent condition with no damage, crazing or restoration, and the gilding is in fine condition. 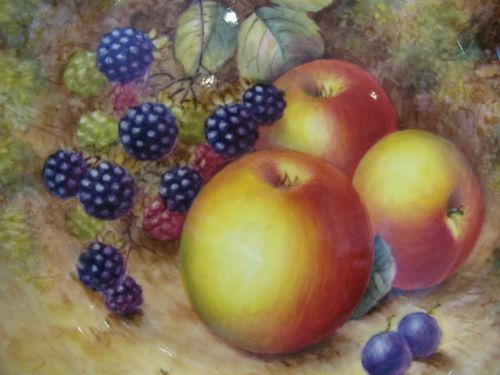 A Royal Worcester Fruit Painted Pin Dish By L. Maybury. A Royal Worcester Fruit Painted Pin Dish By W Roberts. 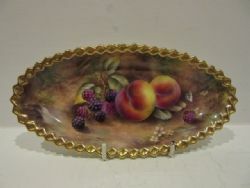 A Royal Worcester porcelain pin dish with shaped , gilded rim and fruit painted decoration by William Roberts. 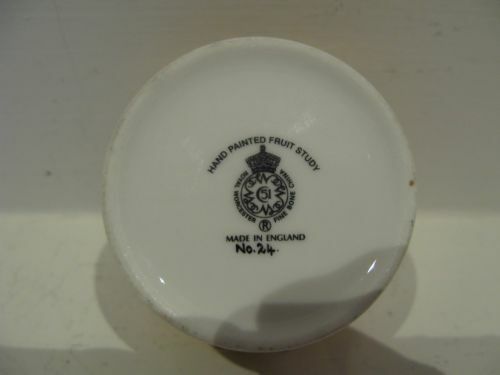 Standing approximately 4.3/8"diameter x 3/4"deep, it has the black factory stamp for circa 1975 and is in excellent condition with no damage, crazing or restoration, and the gilding is without wear. 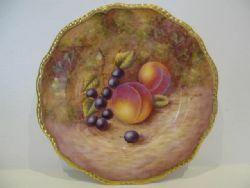 A Royal Worcester Fruit Painted Pin Dish By W. Roberts. 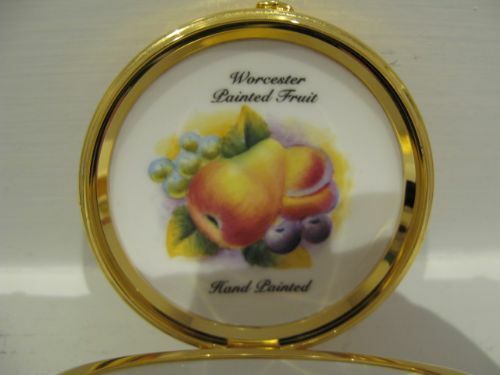 A royal Worcester porcelain pin dish with shaped, gilded rim and fruit painted decoration by William Roberts. 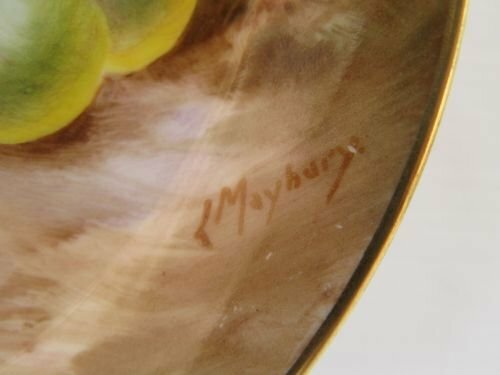 Standing approximately 4.1/4"diameter x 3/4"deep, it has the black factory stamp for 1960 and is in excellent condition with no damage, crazing or restoration, and the gilding is without wear. 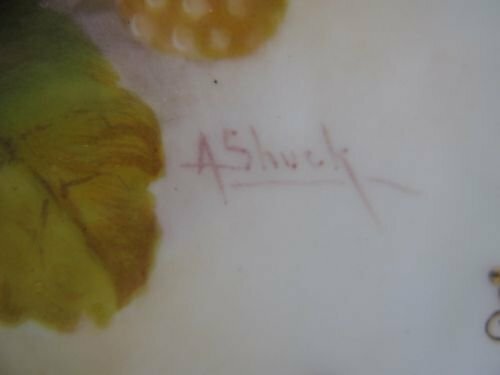 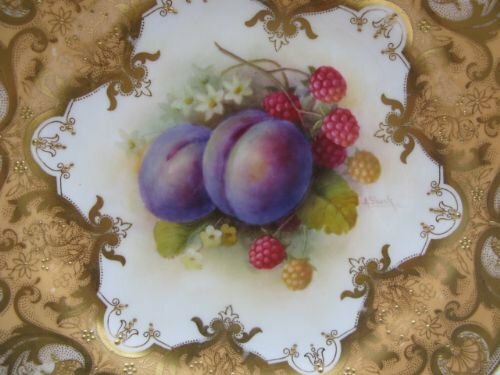 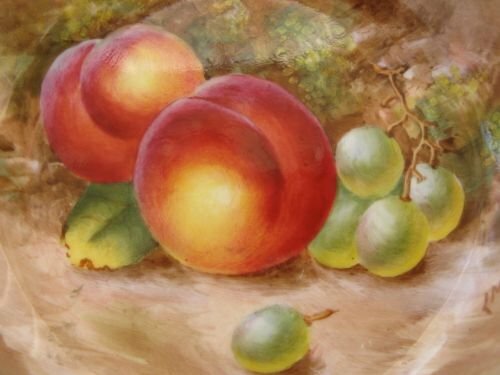 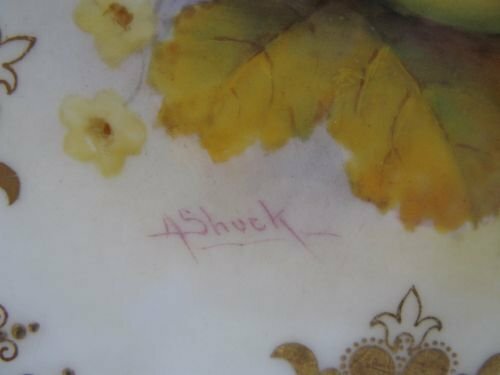 A Royal Worcester Fruit Painted Plate By Albert Shuck. 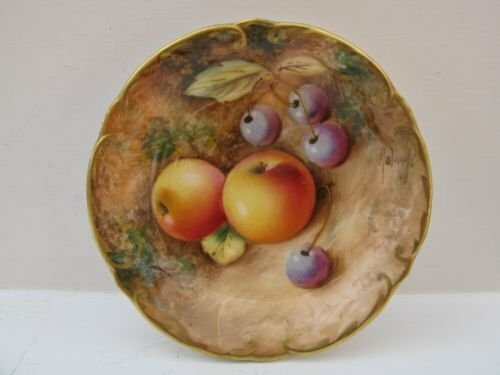 A very attractive, Royal Worcester porcelain plate with superbly gilded border and very well painted central fruit panel by Albert Shuck. 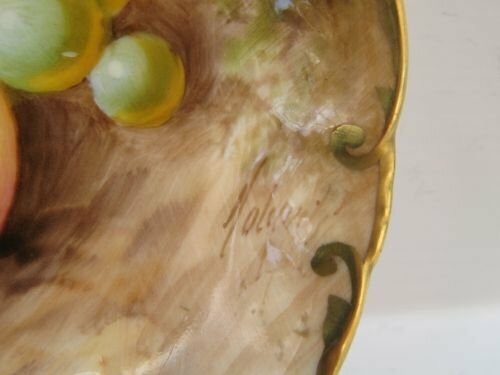 Measuring approximately 9" diameter and with puce factory stamp for 1925, it is in excellent condition with no damage, crazing or restoration, and the gilding is fresh and without wear. 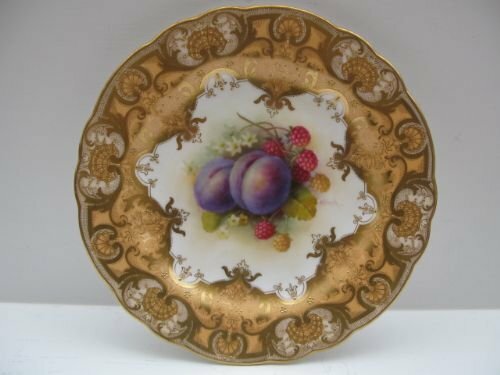 A very attractive, Royal Worcester porcelain plate with superbly gilded border and very well painted fruit decoration by Albert Shuck. 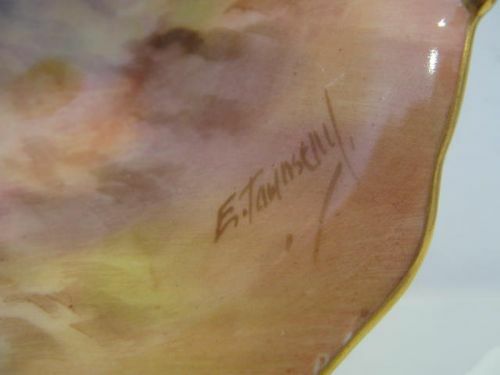 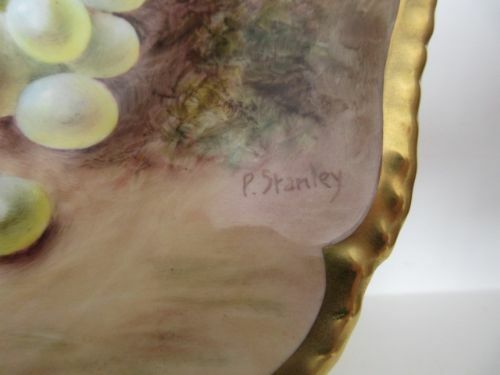 Measuring approximately 9" diameter and with the puce factory stamp for 1925, it is in excellent condition with no damage, crazing or restoration, and the gilding is fresh and unworn. 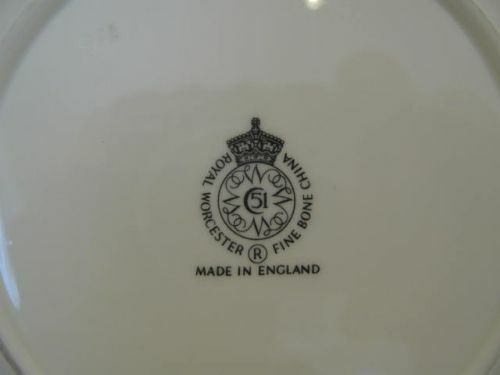 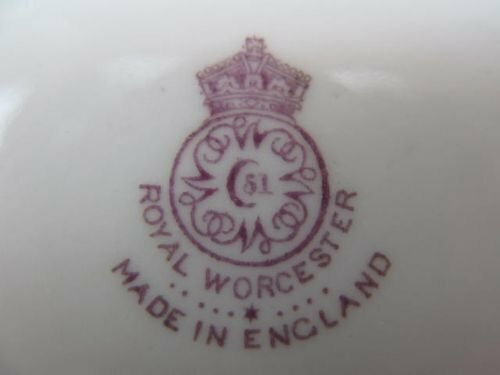 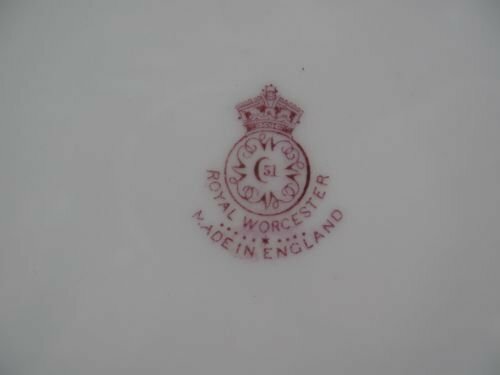 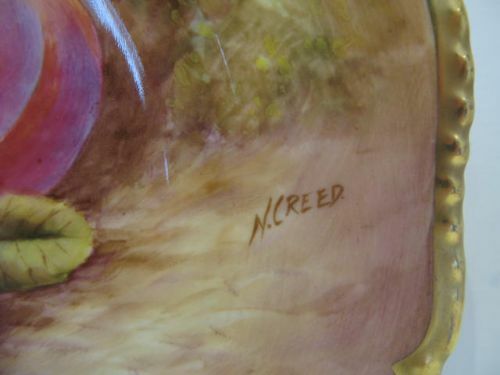 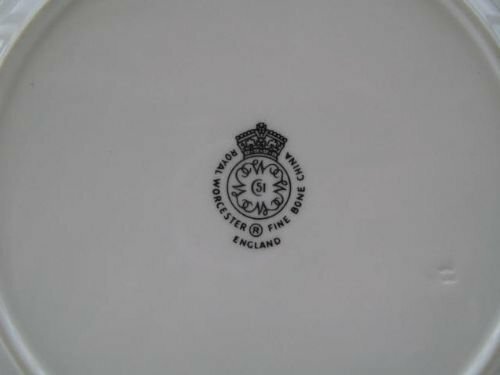 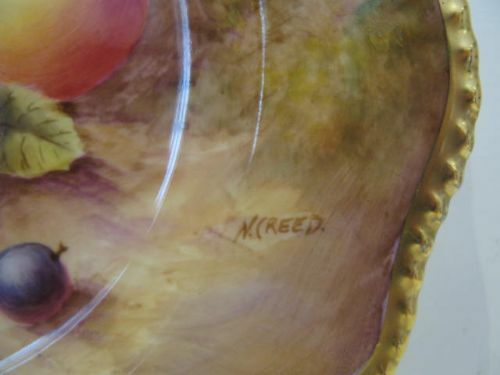 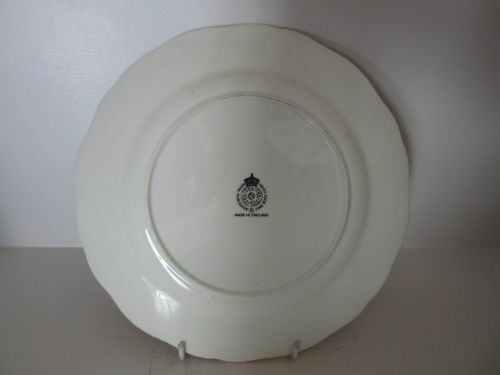 A Royal Worcester Fruit Painted Plate By Creed. 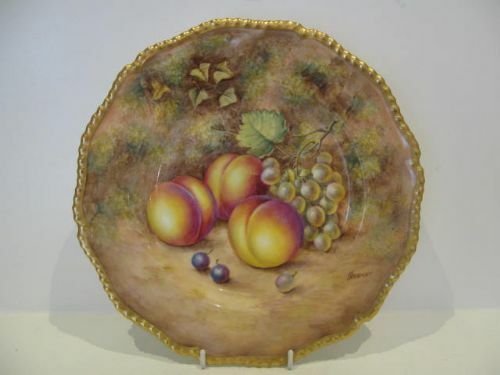 A Royal Worcester porcelain plate with shaped rope-twist rim, and fruit painted decoration by Nigel Creed. 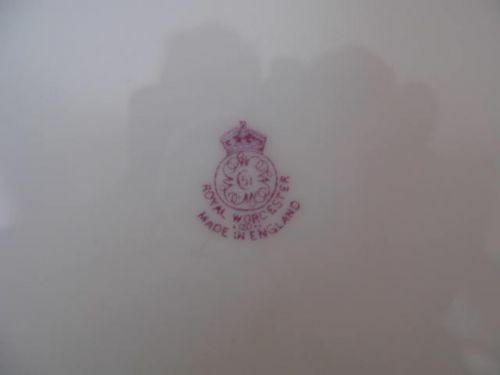 factory stamp for circa 1975 and is in excellent condition with no damage, crazing or restoration and the gilding is bright and without wear. 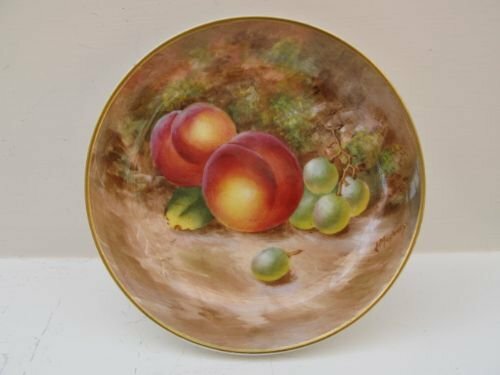 A Royal Worcester porcelain plate with shaped rope-twist rim, and painted fruit decoration by Nigel Creed. 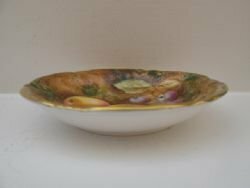 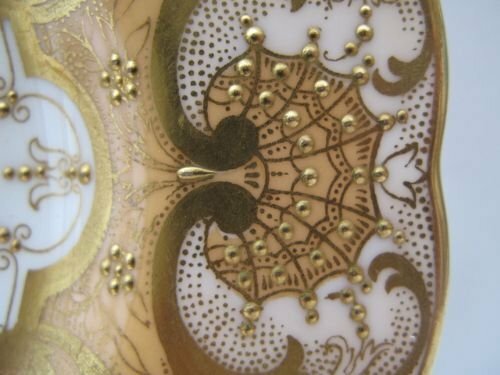 Measuring approximately 7.7/8"diameter, it has the black factory stamp for circa 1975 and is in excellent condition with no damage, crazing or restoration and the gilding is bright and without wear. 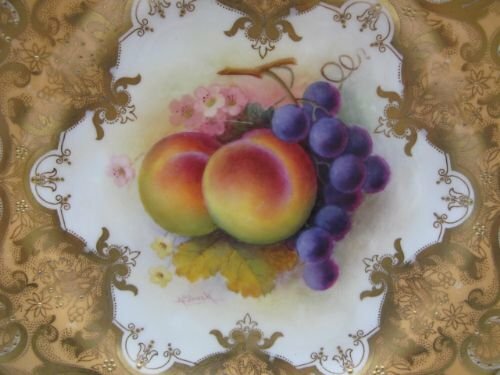 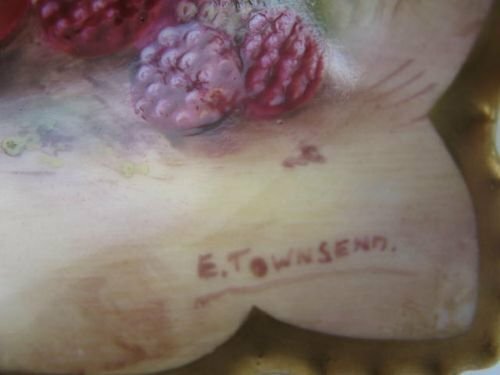 A Royal Worcester Fruit Painted Plate By E Townsend. 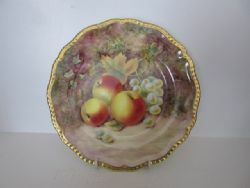 A good Royal Worcester porcelain serving plate, with well painted fruit decoration by Edward Townsend. 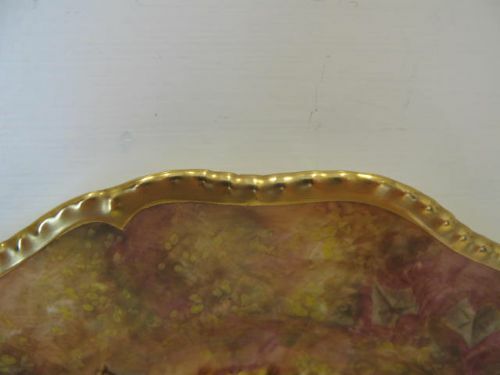 Measuring approximately 10.1/2"long x 8.3/8"wide, it has the puce factory stamp for 1940 and is in excellent condition with no damage, crazing or restoration, and the gilding is bright and shows virtually no wear. 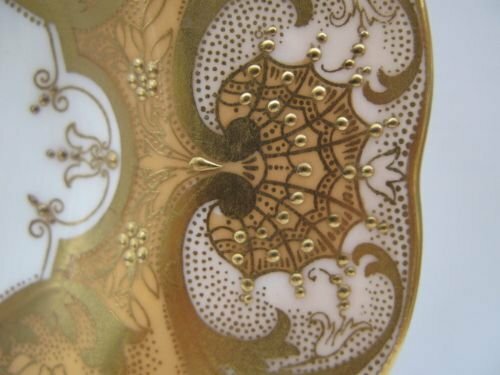 Any white dots or lines are reflections only. 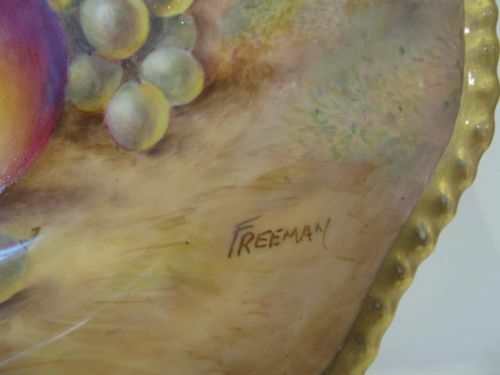 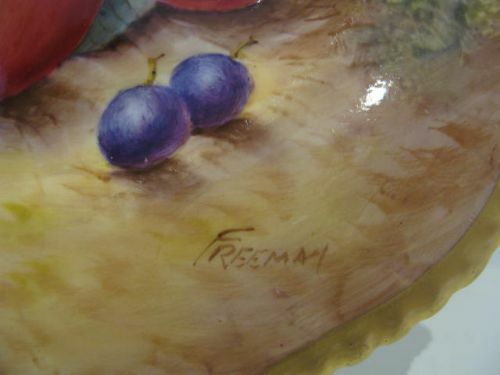 A Royal Worcester Fruit Painted Plate By Freeman. A good Royal Worcester porcelain cabinet plate, with heavily gilded gadrooned rim and well painted fruit decoration by John Freeman. 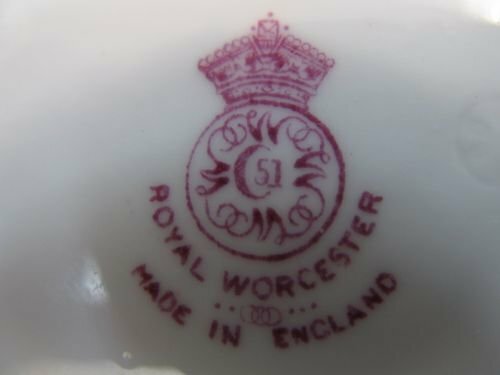 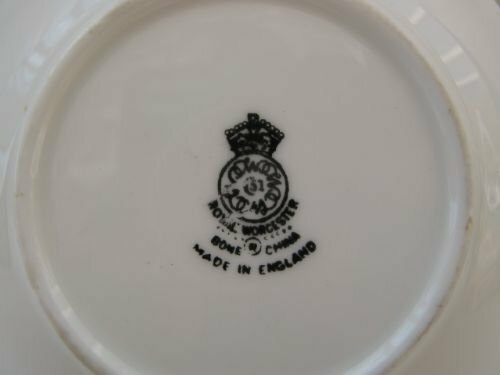 Measuring approximately 10.1/2"diameter, it has the black factory stamp for circa 1970 and is in excellent condition with no damage, crazing or restoration and the gilding is in fine condition. A Royal Worcester porcelain cabinet plate, with heavily gilded and gadrooned shaped rim and well painted fruit decoration by John Freeman. 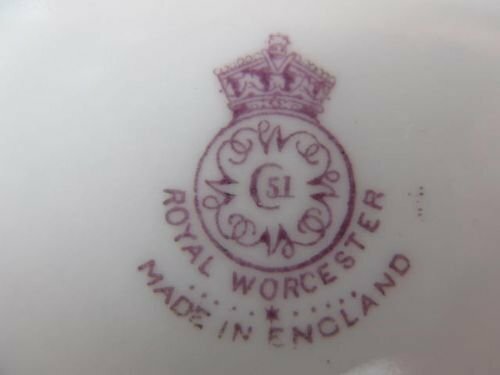 Measuring approximately 10.1/2"diameter, it has the black factory stamp for circa 1970 and is in excellent condition with no damage, crazing or restoration and the gilding is bright and without wear. 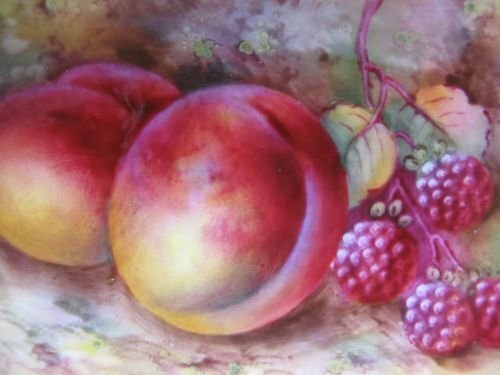 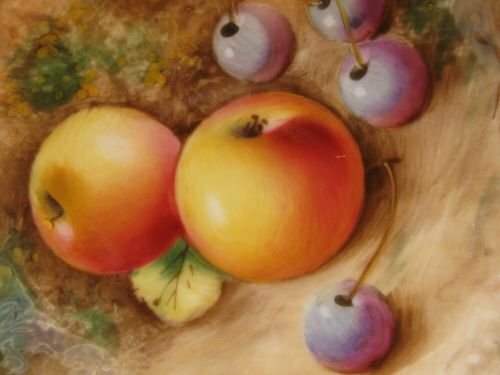 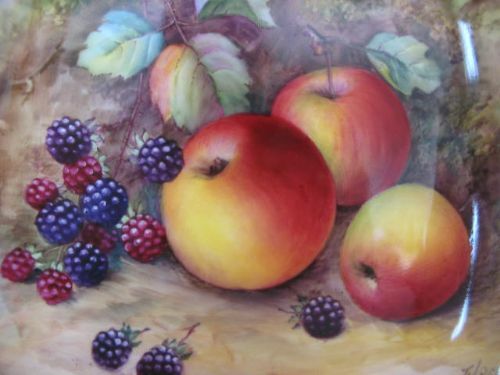 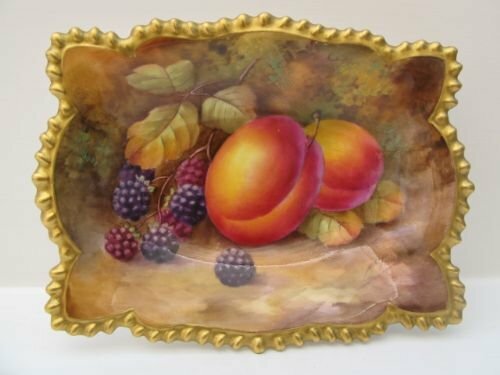 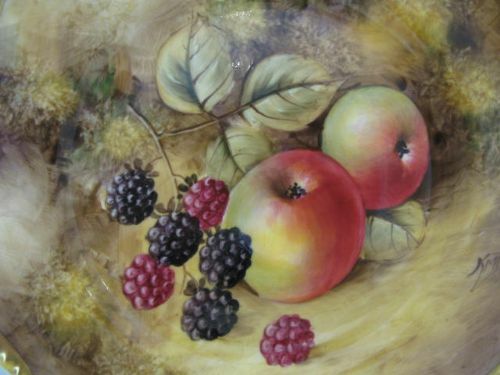 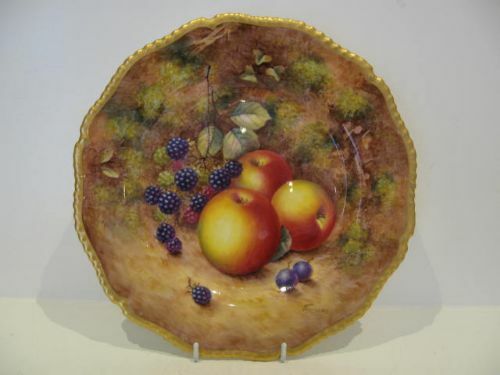 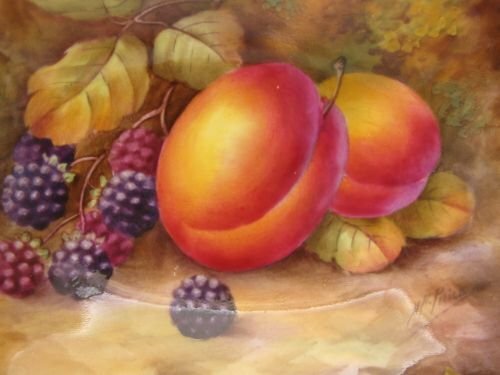 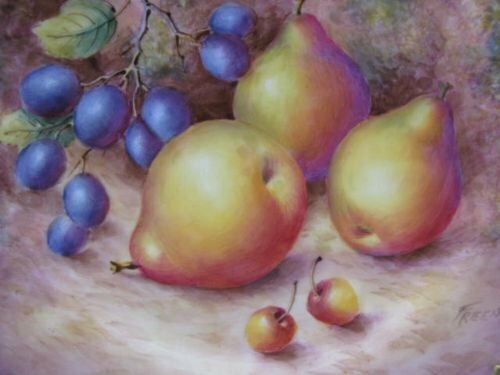 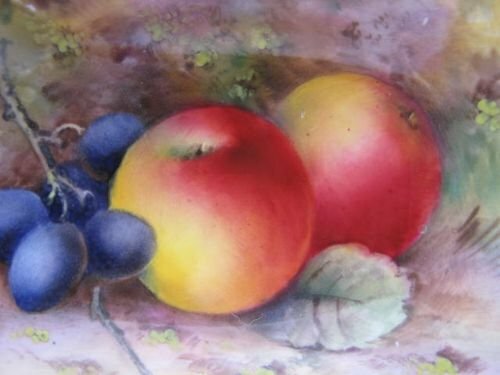 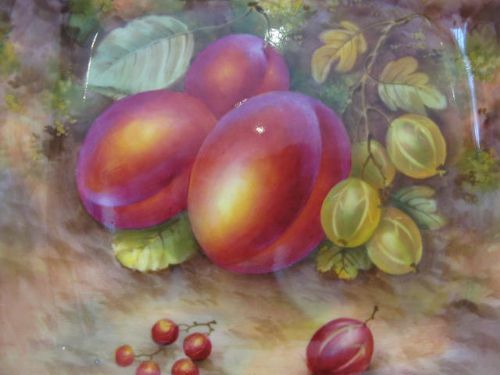 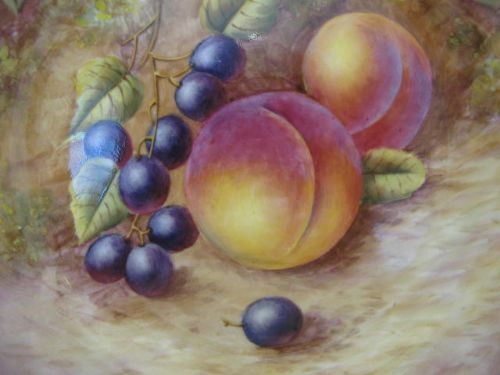 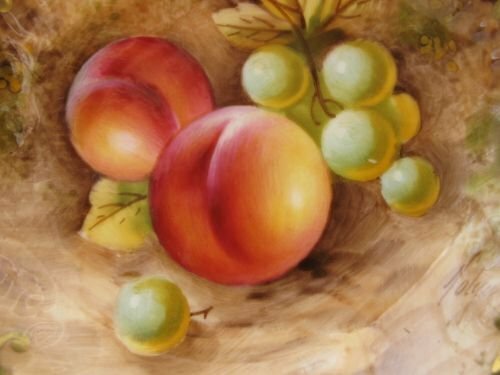 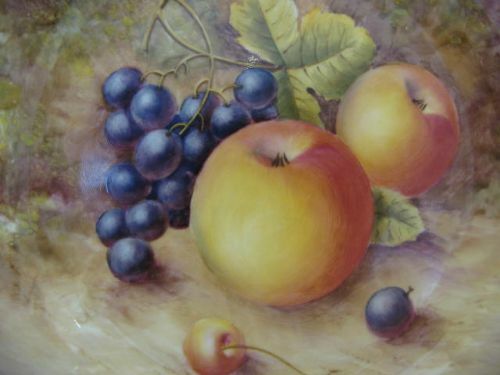 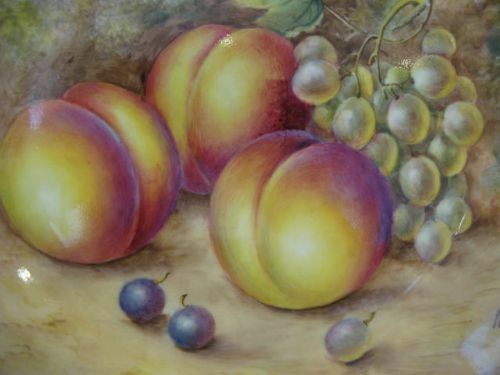 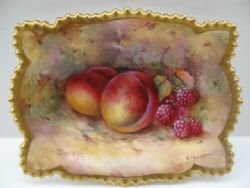 A Royal Worcester Fruit Painted Plate By John Freeman. 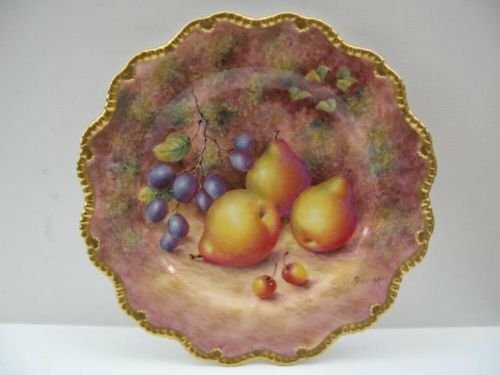 A Royal Worcester porcelain cabinet plate with heavily gilded, shaped gadrooned rim, and well painted fruit decoration by John Freeman. 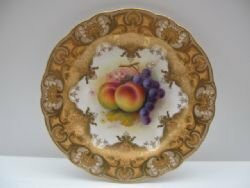 Standing approximately 8.3/4"diameter, it has the black factory stamp for circa 1970 and is in excellent condition with no damage, crazing or restoration, and the gilding is fresh and unworn. 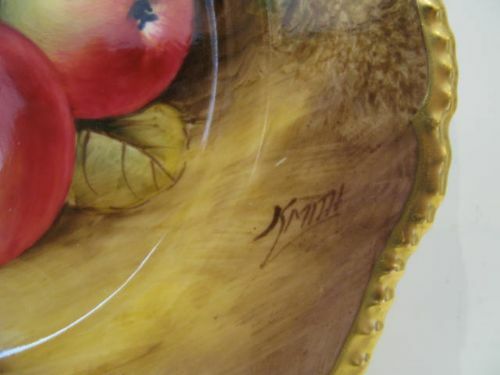 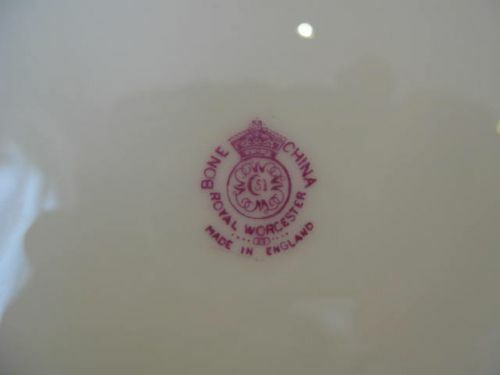 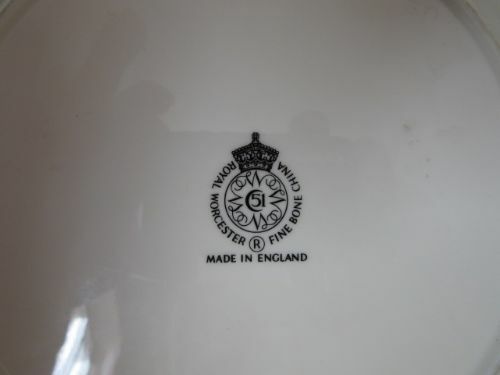 A Royal Worcester Fruit Painted Plate By Smith. 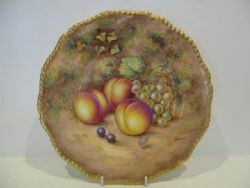 A Royal Worcester porcelain plate with shaped rope-twist rim, and fruit painted decoration by John Smith. 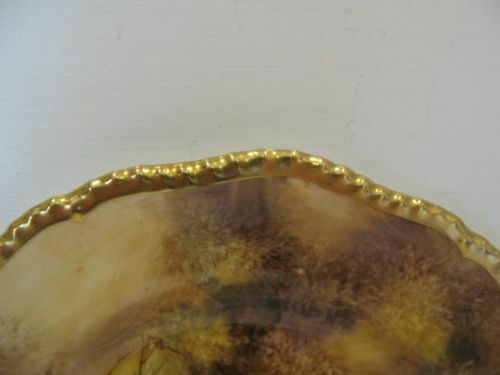 Measuring approximately 8"diameter, it has the black factory stamp for circa 1970 and is in excellent condition with no damage, crazing or restoration, and the gilding is bright and without wear. 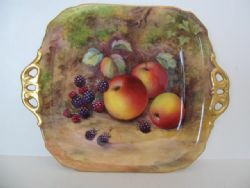 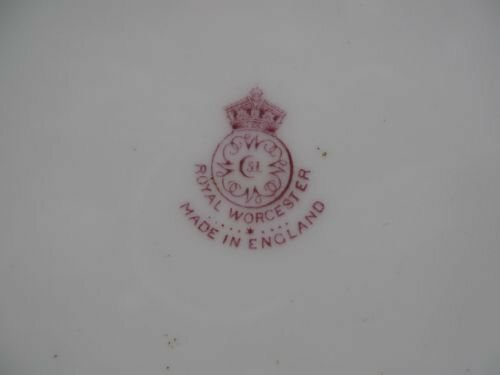 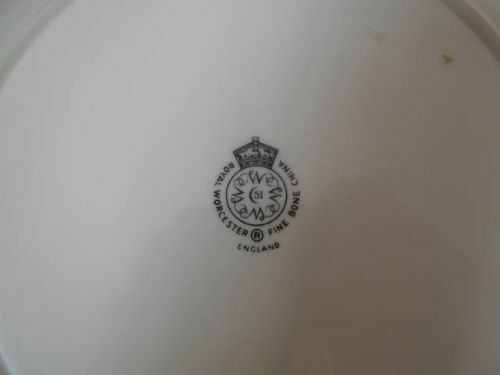 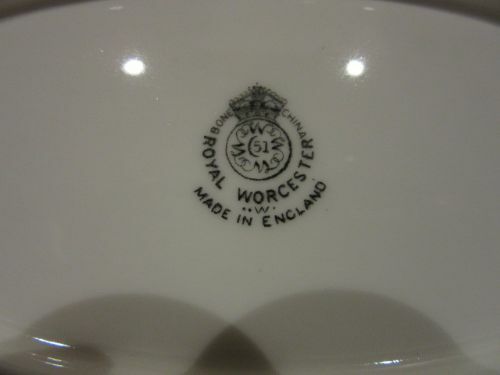 A Royal Worcester Fruit Painted Plate By Stanley. 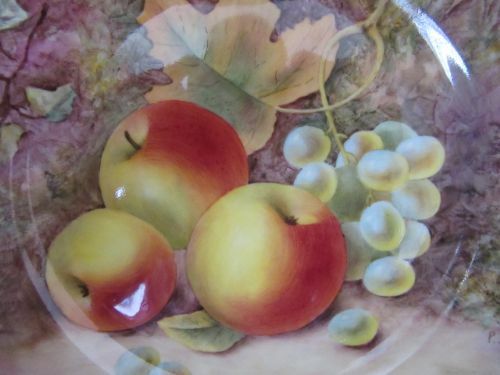 A Royal Worcester porcelain plate with well shaped, heavily gilded rim and nicely painted apples and green grapes against a mossy background by Paul Stanley. 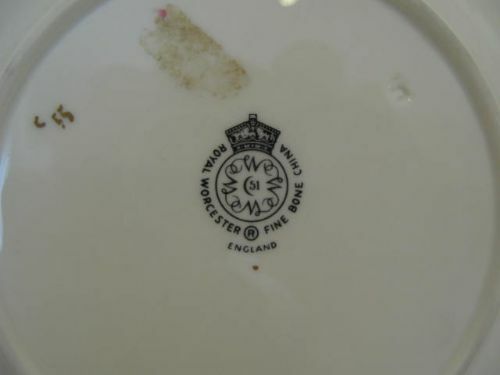 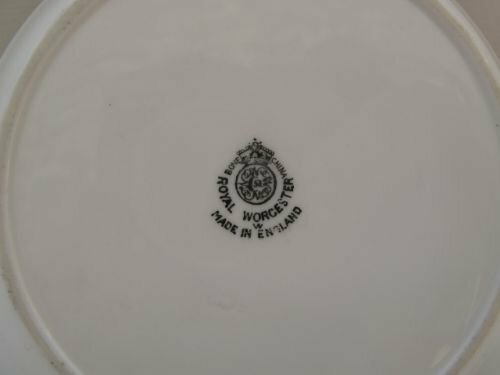 Measuring approximately 9.3/8"diameter x 1"deep, it has the black factory stamp for circa 1970 and is in excellent condition with no damage, crazing or restoration and the gilding is virtually without wear. 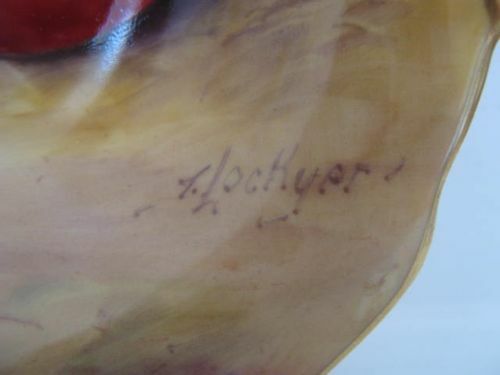 A Royal Worcester Fruit Painted Plate By T. Lockyer. 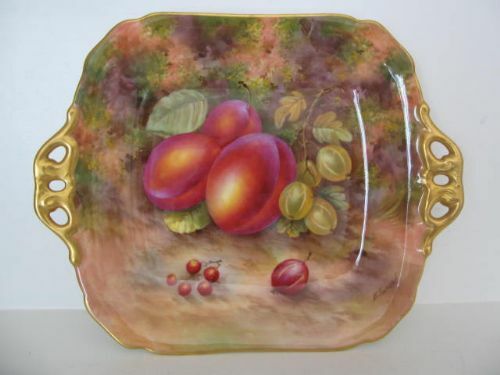 A good, Royal Worcester porcelain two handled rectangular serving plate, with very well painted fruit decoration by Thomas Lockyer. 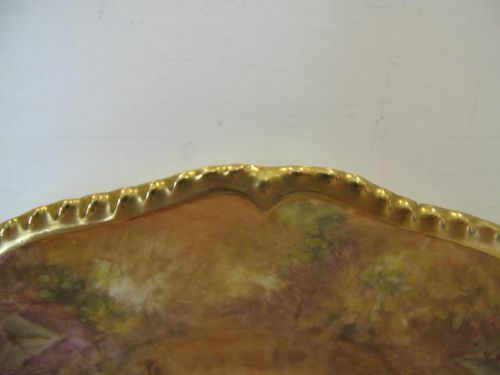 Measuring approximately 11"long x 8.3/4"wide x 1.1/4"deep, it has the puce factory stamp for 1935 and is in excellent condition with no damage, crazing or restoration, and the gilding is bright and with virtually no wear.